On the hot air balloon over Cappadocia, early in the morning. “Are you alright?” One of the Canadian nurses who’s name I have not yet memorized asks me, sitting down on the bench by my side. I’m squeezing my eyes shut, gently clutching my stomach. My stomach is the bane of my existence while traveling, especially in countries with massively different diets. I can’t figure out what is bothering it right now, though: I ate very carefully the first few days in Istanbul. So I cruse my bad luck. We’re sitting in the lobby of the bus station, about to get on a 12 hour overnight bus to Cappadocia. And I know that once we get on the bus, we’re all headed straight to the back 17 seats, so I’m worried about my nausea keeping me awake all night as it is. But it’s only 12 hours. I can do anything for 12 hours, yes? The pains continue to shoot through my stomach as we settle into our seats on the bus. My roommate Victoria sits next to me, an Australian girl who’s also been traveling through Europe for several months and also come to Turkey after months of dreaming about it. The group I’m traveling with is a diverse mix of Australians, Americans, English folks and Canadians, with one woman from Mexico – 16 of us in total; 2 men and 14 women. We’re all in our late twenties or early thirties. Incidentally the group also contains 4 nurses, one woman who worked as a nurse for 12 years and a hospital administrator, so you'd think if anyone had any health problems, we'd be in good shape. The bus stops every 2 hours or so for 20 minutes so everyone can use the toilets or get some more snacks. We all sleep shakily, heat blasting on our feet and air conditioning blowing down from above our heads. I curl into several different kinds of balls, contorting and waking myself up when my muscles have clenched any one way too long. The dull ache in my stomach, agitating to shooting pains whenever I move at all, remains the entire night. It’s not quite nausea, and it’s not my normal “something’s not sitting well” pain, which worries me but I try to ignore it as best I can while we're on the bus, counting down the hours. Others begin to moan and twist in their seats as Elif mentions breakfast will be ready for us when we arrive at the hotel. One woman has broken away from our section in the back of the bus, sprawling across several seats as far ahead as she can get, afraid she’ll become ill soon. We arrive at the hotel and everyone collapses and curls up into a chair in the lobby, head in their hands, moaning and groaning at various pitches and tempos. No one wants, or needs, to know anything more about the stomach virus that took almost every single one of us down on our first day in Cappadocia. It was a bad one, to say the least. So all I knew of this enchanting, surreal landscape of valleys filled with bizarre “fairy chimneys” was a blur from those last, curvy miles on the bus as the sun rose and the report of a good hike Victoria took with Elif early that afternoon before she too landed in bed, unable to do much by moan and puke for a good 24 hours. 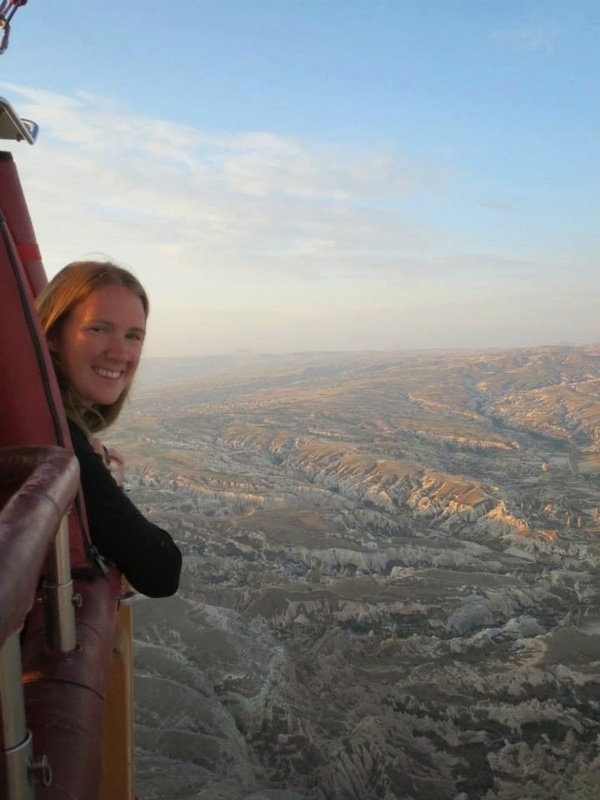 The thing everyone does in Cappadocia is take a hot air balloon ride as the sun is rising. It’s the best way to see the landscapes of the area and it’s probably one of the most unique places in the world to take a hot air balloon ride. This was not included in our budget trip, and I was on the fence, but after seeing photos from the group who took the tour the week before us, I was convinced that if I ever wanted to take a hot air balloon ride, Cappadocia was the place to do it. That night, when Elif came into our room with two plates of plain rice and some Sprite, even though I could hardly sit up without feeling faint and sending pains shooting down my stomach, I rolled off my bed and found my credit card so she could sign me up for the 4:50am ride. Our views from the hot air balloons over the fairy chimneys and hills. I honestly don’t know how everyone in the group rallied, nor do I know what our balloon operator thought of us, leaning against the basket, pale faced and dazed, but everyone made it that morning for a spectacular sunrise balloon ride, and some of us even shared in the (nonalcoholic) champagne toast when it was over. Those of us who were well enough spent the day wandering through the Open Air Museum, a collection of ancient cave churches where some of the first Christians hid their new religion from the Romans. The rock of Cappadocia is relatively soft and these mazes of valleys were perfect hiding places. In the caves are perfect domes, ancient paintings of saints, bodies of the original priests and stone altars. No more than 20 or 25 people could have crammed into each of these tiny holy places at once and with the plethora of tourists moving in and out of each one, it was hard to imagine this being a very solitary hiding place. We also toured an underground city, another hiding place for the original people of the region – the Hittites – and later the early Christians. The “city” was really a maze of caves and hollowed out caverns where hundreds of people and their animals could hide from invaders for months at a time. We climbed the “castle” which was more of a fort, filled with rooms and tunnels carved into a tall stone hill for a fantastic view of the entire Goreme and Pigeon Valleys around us. We also got a Turkish rug weaving lesson from a local woman and visited a gallery of artisan carpets, getting to touch and roll around on the difference between a wool and a silk rug. supposedly much more long lasting than Persian rugs. Perhaps the most interesting adventure of Cappadocia was the very authentic Turkish Bathhouse. I went to a “bathhouse” in Hungary, but my god, I had no idea what this actually meant until I was in a room with 14 other naked women, laid out in marble slabs getting a rub down with rough material to remove all of our dead skin, then a silky soap massage while our Turkish masseuses shouted and laughed around us. Then there was the olive oil rub down and of course the apple tea afterwards. If we were not already intimate because of the stomach flu we had all shared, this certainly brought us close together quickly. Another free day of hiking and shopping in Cappadocia, and everyone was more or less recovered before a second overnight 12 hour bus ride to Antalya, near the Mediterranean. After a rainy, lazy day in the village of Çirali we woke up early to climb Turkey’s Mount Olympus and see the flaming rocks – a phenomena that is somehow perfectly natural, but totally surreal. It’s not surprising the locals assumed a dragon was trapped under their regional mountain. Finally, we hit the coast, driving along a beautiful, scenic – though curvy – road to a port near the Kekova Islands, where we boarded our private boat, complete with bar, a tiny kitchen from which came the most delicious food, and a top deck where we would spend the night sleeping under the stars. On the boat, we did nothing but relax and lay in the sun, which was pretty incredible. The captain would drive us to one inlet of clear warm, Mediterranean water after the other, let us jump off and swim for an hour or so, then move on to another. The Australian girls and I at the front of the boat, enjoying a beer after a swim. Our boat home as the sun set. As we snaked our way through the islands to the port where we spent the night, we passed by the sunken ruins of an ancient Greek port town. As the waters rose in the last centuries, the ruins of the city fell below the sea level centimeter by centimeter, and now there are only skeletons of structures on the cliff walls. But from at the bottom of the sea, if you have a boat that you can look down at what lies beneath the water, you can see shards of pottery, house foundations and other relics of the lives lived along the shores thousands of years ago. The ruins of a sunken Greek city. That night, happy, healthy and sleepy we all lay down on the upper deck of the boat, while Isa from Mexico told us bed time stories, including the Greek myth of how the Aegean Sea got it's name. In the distance, the call to prayer sang through the hills from the village in the port, and the moon rose as a firey red sliver above us. The sky awash with stars, I lay there, thinking about all the roads millions of people have taken over the centuries to arrive here, in the Mediterranean. And here I am among them, all those stories and memories and histories, weighed down the grandeur, and grateful for the chance to be among the waves.